In blender, place Sauce ingredients; cover and blend 1 to 2 minutes or until smooth. Transfer to 2-quart saucepan. Heat to simmering over low heat. Meanwhile, in 12-inch nonstick skillet, heat 1 tablespoon olive oil over medium-high heat. Add bell peppers, onion and salt. Cook 5 to 7 minutes or until softened and beginning to brown on edges. Transfer to medium bowl; set aside. Wipe out pan. Add 1 tablespoon olive oil to skillet; place over medium heat. Add eggs to skillet; cook 30 to 45 seconds or until edges of whites are set. Drizzle water over eggs; cover and cook 1 to 2 minutes longer or until yolks are set. Divide rice among 4 bowls. Top each with onion mixture and beans. 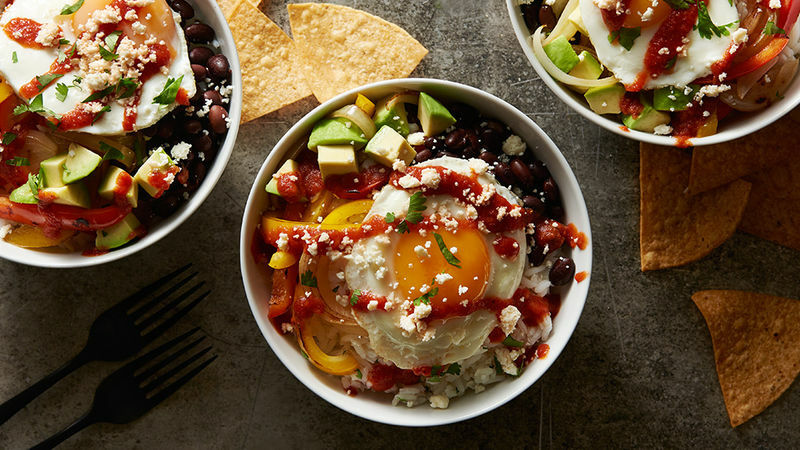 Top each bowl with an egg. Top with avocado. Drizzle with sauce, then sprinkle with cheese and cilantro. Serve with chips. The sauce and the onion mixture can be made up to a day ahead. Reheat onion mixture before serving. “Faux” frying eggs with steam is an excellent way to cook eggs without using lots of oil.